Are you trained to go the medicine cabinet any time you have a headache? Or neck pain? Or some other sort of ache or pain? Here’s a secret: very few chronic aches and pains happen because of a shortage of Advil, Tyelenol, or Bayer in your blood stream. In other words – there is a cause you aren’t fixing by covering up these body pains that keep coming back. And many, many cases of chronic pain do not improve, heal, or get better because chronic pain is a symptom of repeat body trauma. Sometimes a big, big trauma, like major car accidents and skiing injuries. Sometimes a little trauma, like a bump in the head here. A fall on the ice there. Or, years of sitting without moving in front of a computer. As this big and little trauma adds up, the body does what it can to adapt and heal. It’s better to bend than to break. So the spine locks in to protect what it can. And over time, everything shifts, pulled down by the weight of gravity. Rather than expanding upward, the posture gets pulled downward. Nerves get stressed. Lymph doesn’t drain as well. Veins get backed up. And arteries have to push with more pressure. One of the most common signs of this breakdown is the loss of the natural, healthy curve of the neck. 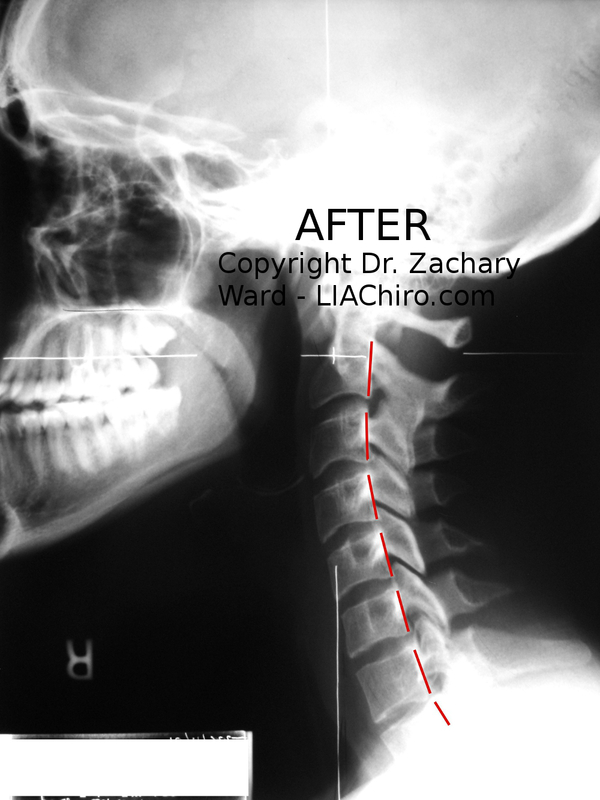 The normal, healthy appearance of the neck is to have a nice, gentle curve forward. The gentle curve balances the head, and protects the important nerve tissue in the neck. Without the curve, there is more stress placed on the joints, ligaments, and muscles of the neck. As the curve is lost, the neck moves forward, placing up to 10 to 50 extra pounds of downward pressure on the spine. Here is a picture of a neck with a gentle forward curve. 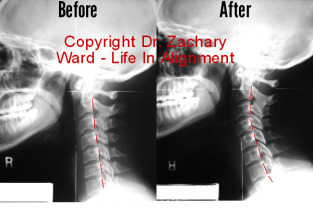 The image is of a patient at Life In Alignment Chiropractic after about 3 months of gentle, upper cervical chiropractic care. If you start at the bottom bone, and trace the red lines with your eyes, you will see that they form a gentle curve. 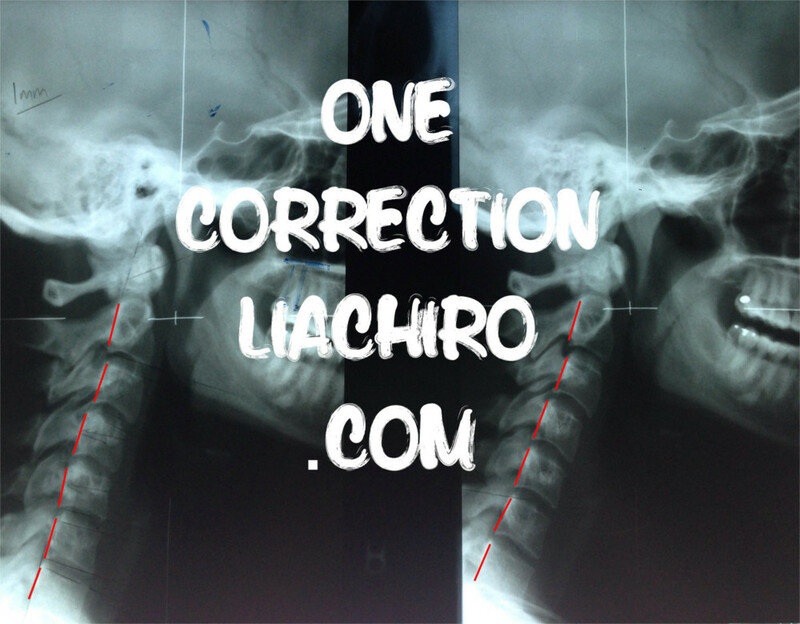 You might be surprised at how quickly a neck changes position with the right spinal care. Gentle, specific chiropractic care, especially focused on the top of the neck – often leads to immediate changes in spinal alignment. 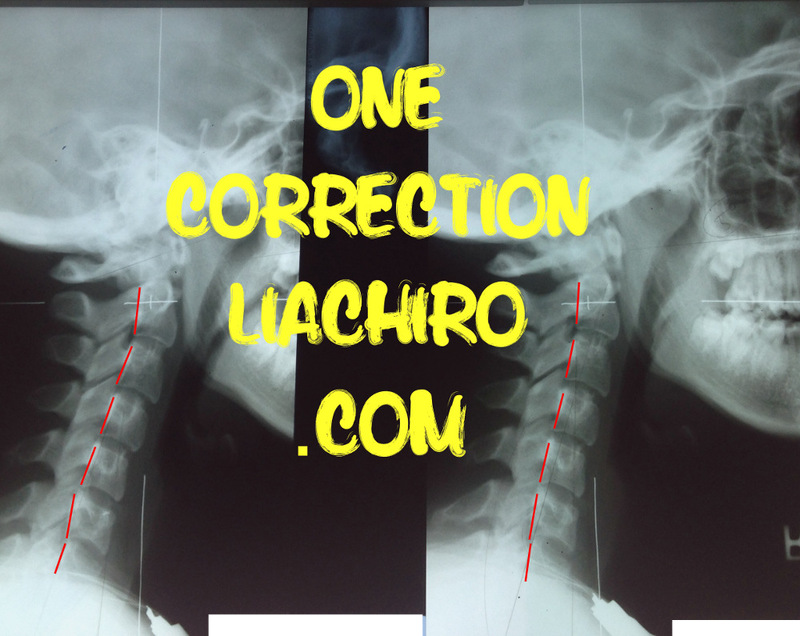 Yes, there are people who will tell you that chiropractors “don’t align anything”. They say alignment changes are impossible without a lot of therapy, exercise, and traction. That includes some misguided chiropractors. But it is hard to argue with pictures that show changes in the curve. Now, the point of my practice isn’t to force your neck into a proper curve. But it is to release and unlock misalignments (in cooperation with your body’s intelligence) that keep your spine locked in pain and dysfunction. Often, the neck starts moving into a proper curve. Sometimes very, very quickly. Even after only one correction. Below are three before and after images that have been marked to help you see the changes in the curve. Most of these patients have a pretty severe loss of their neck curve. And the after picture isn’t perfect. But you can really see the amazing change they experienced in a matter of minutes. Something that some believe is impossible in the spine. Before (Left) – After (Right). 60 year old female with chronic pain behind the shoulder blade. 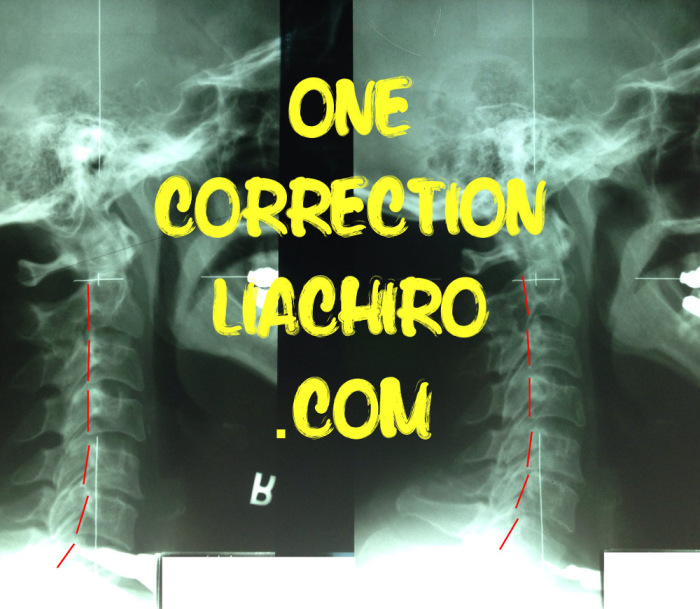 Previous chiropractic care helped, but did not unlock the neck. After image after one correction, with immediate lessening of pain behind shoulder blade. Before (Left) – After (Right). 16 year old female who began experiencing chronic headaches, neck pain, and fatigue after being rear ended in a motor vehicle accident. While there is more work to do, you can really see the change in her overall alignment after one correction. Before (Left) – After (Right). This 33 year old female had chronic low back pain and knee pain while running. The low back pain left after her first visit. Much of her spinal stress is seen in her before picture, which shows the start of a reverse curve at C4 and C5 – where the red lines begin to rotate out of line. The after image is after one correction. The curve hasn’t come back yet, but the lower neck has relaxed and moved forward, and this will allow the curve to come back over time. Keep in mind, the point isn’t to force a curve back into the neck. The point is to release the trauma that has locked the spine into stress. This stress affects the muscles, ligaments, and joints. It can slow flow of lymph, veins, and arteries. But more importantly, it creates constant and chronic background “noise” and stress on the spinal cord, affecting the nerve system. These three images show that this spine stress can be released relatively quickly, creating a change in alignment and structure almost immediately. Especially in the neck. So, no, your pain pill cannot do this. And if you hear anyone say that chiropractors are unable to really change alignment, email them the link to this page. The right chiropractor, working at the right time, in the right place can help the body unlock more than most know. Post-concussion syndrome, brain fog, and neck alignment? Really?